The National Railways of Zimbabwe (NRZ) is a parastatal body which is based in Bulawayo. The majority of the Zimbabwean railway system was constructed during the initial colonization of the country, with the first railway line reaching Bulawayo in 1897 from South Africa, via Bechuanaland (now Botswana). Subsequent lines were constructed to link the country to Beira in Mozambique (1900) and northwards over the Victoria Falls as part of the "Cape to Cairo" railway vision in 1904. The line between Bulawayo and Salisbury (now Harare) was completed in 1902. Three quarters of the present railway system was built in less than 10 years. Prior to 1980 the company was called the Rhodesia Railways (RR). The RR was formed as a statutory body in 1947 when the former Rhodesia Railways Company was purchased by the Government of Southern Rhodesia. RR was responsible for railway lines in both Southern and Northern Rhodesia, now Zimbabwe and Zambia respectively. Although Zambia gained independence in 1964, it was not until 1967 that Rhodesia Railways surrendered the 1,300 km of railway line in that country and 80–90 locomotives to Zambia Railways. The flag used by the NRZ has the Zimbabwe national colours of green, yellow, red, black and white in equal vertical stripes at the hoist. The fly is blue with the letters NRZ in yellow, fimbriated in black, in the centre. The emblem of the NRZ is three rail-sections turned 120° between each other between the national colours of Zimbabwe which is displayed on its locomotives and carriages. I cannot find any evidence of a flag that was used by the former Rhodesia Railways (RR). However, the emblem of RR was displayed on its carriages. 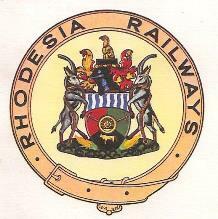 The emblem comprised the coat of arms of the company surrounded by a stylised leather strap (belt) emblazoned with the words RHODESIA RAILWAYS.